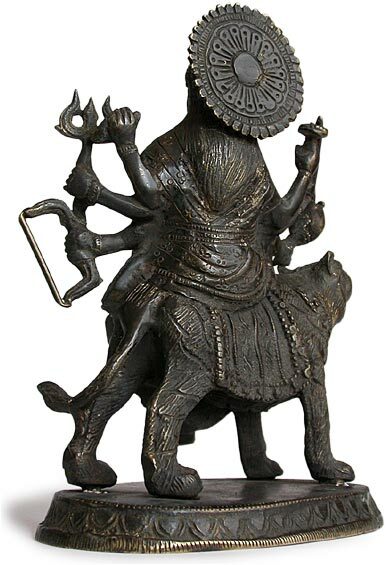 The Goddess Durga is one of the most magnificient of all personifications of Cosmic Energy. She represents the power of the Supreme Being that preserves moral order and truth in the universe. 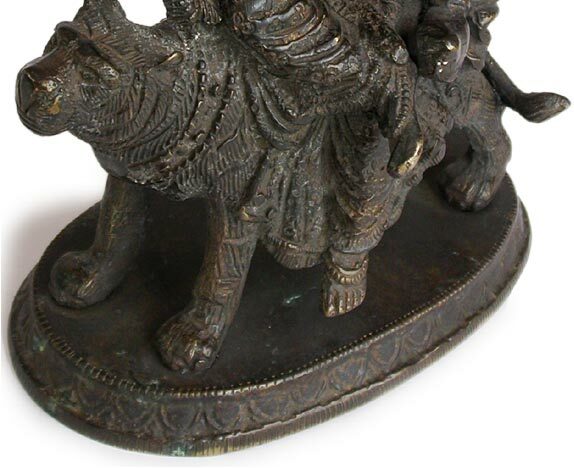 The name Durga literally means "The Unfathomable". 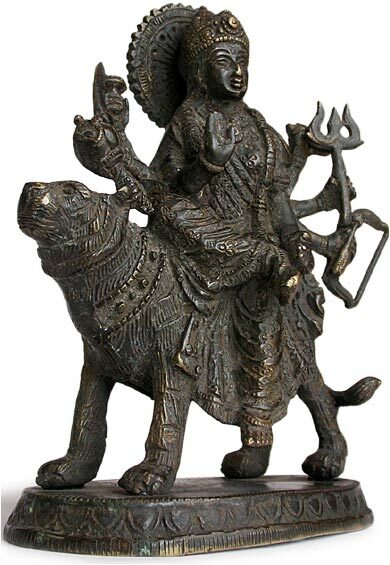 She is also known by many other names such as Parvati, Ambika, and Kali; in the form of Parvati, she is the spouse of Lord Shiva, and is the mother of Ganesha and Karttikeya, and daughters Saraswati and Lakshmi. The Devi Goddess is venerated as our Divine Mother who protects mankind from evil and misery by destroying evil forces. 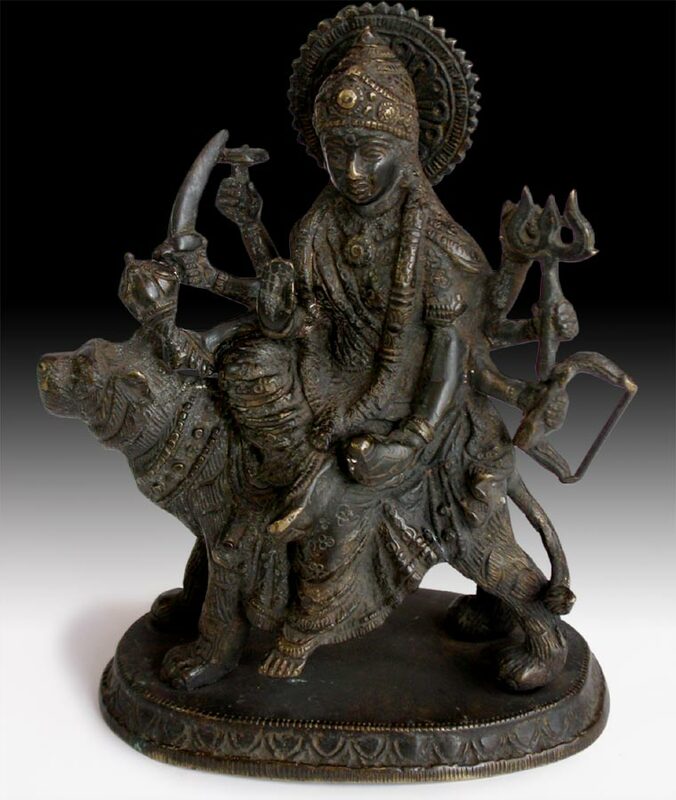 As depicted here in one of the most invoked forms of the Great Goddess, this antique South Indian bronze portrays Durga in her manifestation as the youthful, multi-armed deity in a compassionate countenance. The omnipotence three-eyed Goddess was adorned with eight arms, each held an auspicious emblems or weapons, she wore garlands and rosaries of beads, jewels and ornaments offered by the gods. 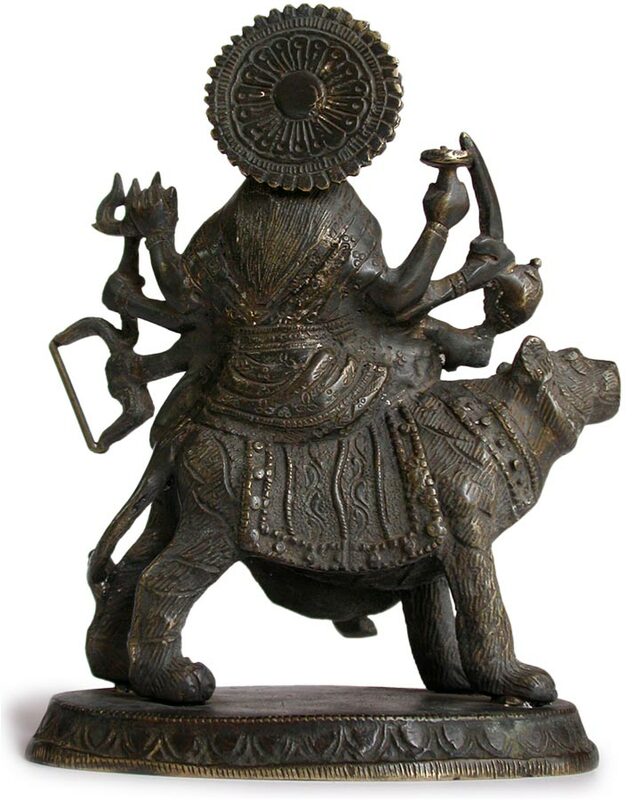 With the radian sun as her halo, her body blazing with the splendor of gold, seated on her tiger vehicle, in her main her right hand the goddess exhibits a protective mudra abhayaprada, and in left she holds a conch that signifies the ultimate victory of virtue over evil.